With an authenticity that's as raw as Franklin County moonshine, there's a visceral quality that permeates the soundtrack of Lawless. The Prohibition-era gangster film that centres around a family of Virginia bootleggers was released to theatres last week, but the music could easily have been lifted directly from long-abandoned smoky stills deep in the Blue Ridge foothills. Nick Cave and fellow Bad Seed, Warren Ellis, have a reputation for musically capturing the glory and the pathos of a film. Earlier collaborations on the soundtracks to The Proposition, The Assassination of Jesse James by the Coward Robert Ford, and The Road have all resulted in hauntingly unforgettable recordings. With their intuitive treatment of the recordings on the Lawless soundtrack, their reputation remains intact. Much of the power of this album lies in the legitimacy of the musicians who lend their voices to the tracks. Mark Lanegan's leathery raucous baritone, Emmylou Harris' fragile vibrato, and Ralph Stanley's archaic bluegrass vocals (used with such perfection in the soundtrack to the Coen Brothers' film Oh Brother Where Art Thou?) were perfect choices. These songs feel completely genuine, transported from early Americana, although they have decidedly more contemporary roots. With the notable exceptions of Fire in the Blood, Cosmonaut, and the hauntingly beautiful instrumental End Crawl, which were written for the film by Cave and Ellis, the majority of tracks are covers of Captain Beefheart, Link Wray, Townes Van Zandt, Jason Lytle, and Velvet Underground songs. Interestingly, many songs appear on the soundtrack twice, each rendered completely unique from the other by vastly divergent interpretations. Of particular interest is the difference between Lanegan's boisterous fiddle-driven take on White Light/White Heat and Stanley's raw and simple acoustic version. The Emmylou Harris numbers are particularly evocative. At times her haunting voice functions almost as background instrumental; at other times, such as in the very Gram Parsons-esque Cosmonaut, it bursts forth in a rush of pure naive joy. 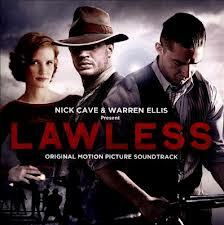 The soundtrack to Lawless will transport you. Just make sure to bolt the door first against the mobsters and the deputy's men before you settle down to listen. In the dark. Jug at your elbow. This film is already on my list of Tom Hardy Things To Watch, and now I am super excited to hear the soundtrack as well! And I had no idea Nick Cave was involved with this film. That is awesome. How could I have forgotten about your Tom Hardy Things to Watch list, BAP? Throw in the Nick Cave screenplay and soundtrack, and this film is BAPtastic! Wow, this sounds great! I love music that gives me that special itch to set up a still out back. Why did I assume you already had a still set up in Anchovyland, Mr Anchovy? Regardless, you would enjoy this soundtrack, guaranteed.